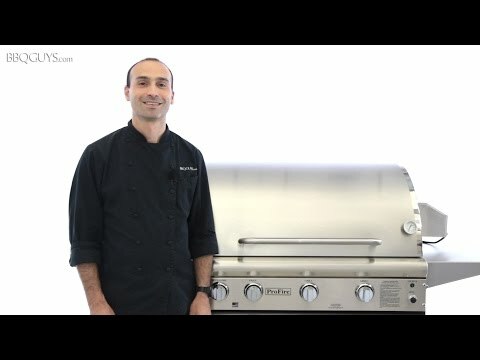 This ProFire Professional Deluxe Series propane gas grill features three controlled grilling zones with six 11,000 BTU stainless steel burners that push 66,000 BTUs of total cooking power on the grilling surface, an attached 30,000 BTU double side burner, and a 13,500 BTU Infra-Roast rotisserie burner. A heavy-duty stainless steel rotisserie motor supports up to 50 lbs. The 16 gauge, commercial grade stainless steel flavor plates are self-cleaning and distribute heat evenly over the entire 714 square inch cooking surface while minimizing flare-ups. The grill is constructed of commercial grade stainless steel with a sleek, curved double lined hood and polished mirror finish. The 5/16 inch stainless steel cooking grates are spaced more closely together than other grill models to better accommodate small items. This ProFire Professional Deluxe Series grill also comes standard with a stainless steel warming rack, a stainless steel smoker tray, dual purpose thermometer, and electronic multiple spark ignitor to enhance your grilling experience. Stainless Steel cart includes two stainless steel fold-down side shelves, access doors for storage, and a LP tank slide out tray. Cooking Grid Dimensions 45 1/4 X 20 1/2"
45 1/4 X 20 1/2" 45 1/4 X 20 1/2" 45 1/4 X 20 1/2" 48 X 20"